MHI :: PASADENA :: STAFF :: Karina Anaya, M.D. Dr. Karina Anaya is a Board Certified Adult, Child & Adolescent Psychiatrist. She is trained in evaluating from an integrative perspective and is dedicated to providing empathic, culturally sensitive care to you and your family. While she is comfortable evaluating children and adults from many diverse backgrounds, she also has a focused interest in LGBTQ mental health and minority mental health. Dr. Anaya is also fluent in Spanish. She incorporates cognitive behavioral and mindfulness-based therapies, either alone and/or in combination with medications. 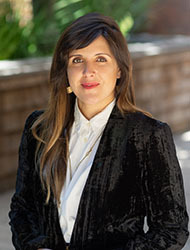 Dr. Karina Anaya attended University of Southern California, where she received a Bachelor of Arts in both Fine Arts and Psychology. She participated in an Art Therapy internship at Children's Hospital of Los Angeles. She graduated from Ross University, School of Medicine. Dr. Karina Anaya completed her General Psychiatry residency training as well as Child & Adolescent specialization at Los Angeles County+ University of Southern California (LAC+USC). She had the opportunity to participate at a Chronic Pain Clinic at Children's Hospital of Los Angeles that utilized a combination of traditional and complementary medicine. During her last year of fellowship, she participated at a Transgender Care Clinic at Children's Hospital of Los Angeles.